The “MID” marking helps me to make a slight adjustment on this towel so that the second half comes out the same as the first half. I like knowing when I am at the halfway point of a piece because it tells me how close I am to completion. 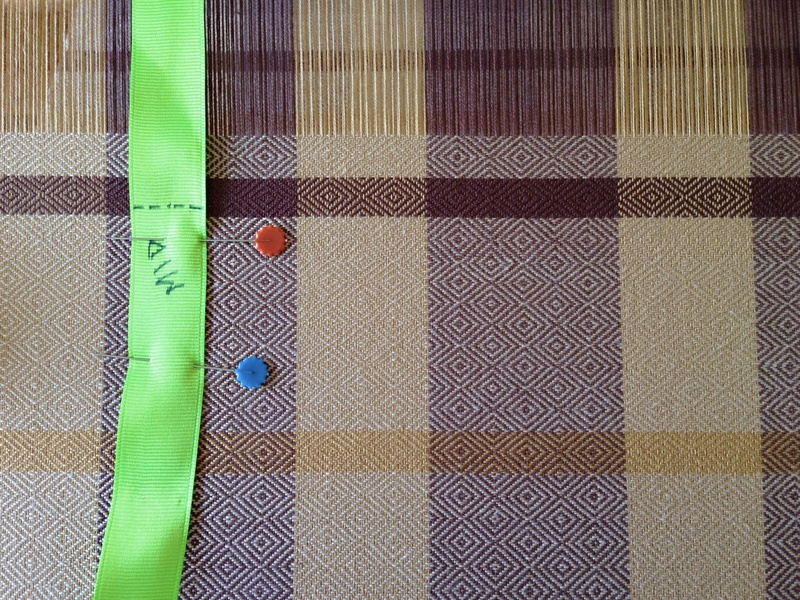 By moving the MID point of the measuring ribbon to the center of the brown stripe, the second half of the towel will be symmetrically aligned with the first half. The midway point is a chance to evaluate and make sure everything lines up. If you could see the midway point in your life, or look back and see that you have passed “MID,” would you live the remainder differently? What adjustments would you make, large or small? If only we could know when we are on the downhill side of life… But we don’t get a “halfway notice” on life, do we? God made us. We did not make ourselves. Do you know a towel that wove itself? I don’t. The good news is that the one who made us wants to complete us. He knows all the necessary marks along the way, and nudges us when adjustments are needed. It is good to know we have a Grand Weaver who cares even more about our completion than we do. May you see where to make adjustments. Beautiful towel and beautiful writing. I found your blog this month and have been enjoying seeing projects and reading the accompanying entries. Deb, Welcome! It’s so good of you to stop in and say Hi. Do you see a goose looking at you? This goose-eye twill is aptly named, as seen in the diamond motif that is woven in the fabric. You can see the motif best where the warp and weft are in contrasting colors. But even where there is little or no contrast, the goose-eye is still there. It’s in the structure. Beginning of the third towel on this warp. The hem is woven in a smaller goose-eye pattern in a stone color. A narrow gold stripe within a wide brown stripe begins an overall checked design for this towel. I find it fascinating that one simple repeated geometric shape can set the tone for the whole cloth. It reminds me of what the great classical composers could do with a single musical motif. Think of what Beethoven did with just four notes in his famous Fifth Symphony! Bah-bah-bah Baahm... Joy is that kind of repeated motif that sets the tone for our days. Joy is the urge to sing on the inside. And it shows up in your countenance on the outside. God loves to see a glad, singing heart. He knows that joy is good for your soul. Sometimes the motif is less visible because of the threads that are crossing your life at the moment. But abiding joy in your structure keeps the melody line alive. May joy be woven in your fabric. I enjoy your skill, your humor and your faith all woven together . . . so glad I found your blog. Once again you touch my heart with your weaving and your words. I always look forward to your email and I save them *S* keep them coming! Friends, your words are an incredible gift to me this morning! Thank you from the bottom of my heart! Rya, Rya, How Does Your Garden Grow? 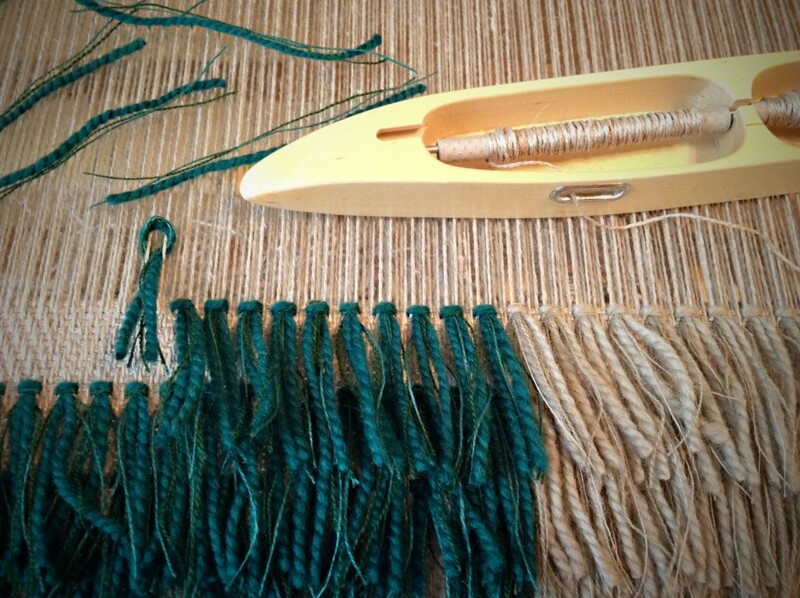 Lay the groundwork; add a row of rya knots. Because of the coarser sett, and the thickness of this doubled linen weft, this rya weaving is progressing faster than the previous one. Tying all 36 knots across the warp is still the slowest part. But I can see progress. I like to see something happening, don’t you? 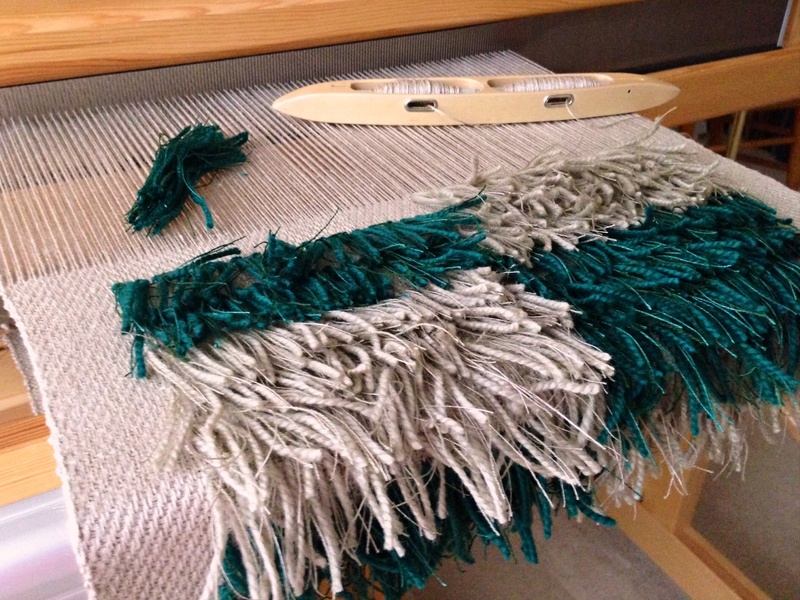 Green strands of thick Åsborya wool, fine Mora wool, and 16/1 linen, sit in a cluster, ready to be separated. Each rya knot is made of three strands, one of each type of yarn/thread. I weave about an inch / 2.5 cm of point twill linen background first. It provides a framework to hold the mixed wool and linen rya knots. This means throwing the shuttle at a good pace for a short distance, and then stopping to add another row of rya. Through this moving – stopping – moving – stopping, progress is made. A little green and beige garden is growing on the surface of the linen structure. It is during the slow part that the “growing” happens. Are you troubled about anything today? Don’t lose hope. If progress seems slow, you may be in a growing season. The Lord rebuilds ruined places and replants desolate fields. It feels slow now, but in time, you will look back and see a garden covering what once was ruins. Keep going, you’re going to make it. I’m weaving a rya bench cover, using the yarn/draft from the Big Book of Weaving. One thing that never gets mentioned anywhere, is that do you wet finish this bench cover? Hi Lori, I had the same questions when I was working on my rya pieces. I tested a small piece and that helped me decide NOT to wet finish the rya pieces. The wool came out fuzzy in the one I washed, very gently, with little to no agitation. I like the more pristine look of the unwashed wool, so I chose to leave the rest unwashed. Rya knots are formed one at a time by wrapping around, under, and through each pair of raised warp ends. The background is woven between rows of rya knots with doubled linen weft, using a double bobbin shuttle. I simply step on the “pile” treadle, which raises only shaft four, and tie rya knots around pairs of the raised ends. This process works because the fabric was planned and designed to have rya knots inserted on its surface. In a similar fashion, people are designed to receive God’s helping hand. God wants to give us the ability to flourish in life. That’s his grace. We are made for that, and it happens when we offer “humble” threads. We must wear the cloth of humility as we interact with each other, revealing our coarse, simple, honest self. This is where God inserts his grace. In this process of his, he patiently makes us his work of art. May you flourish in the things that matter. Thank you so much. We serve such a great GOD. I need to know how to double weave and with that, browsing through your vocabulary list to identify and refresh terms I needed, I found this entry that not only showed me the function of the double bobbin shuttle, but gave me the encouraging words of GOD’s love for me and that HE wants me to succeed. Thank you, Karen for the encouraging word. Dear Pam, Our Lord is so timely. 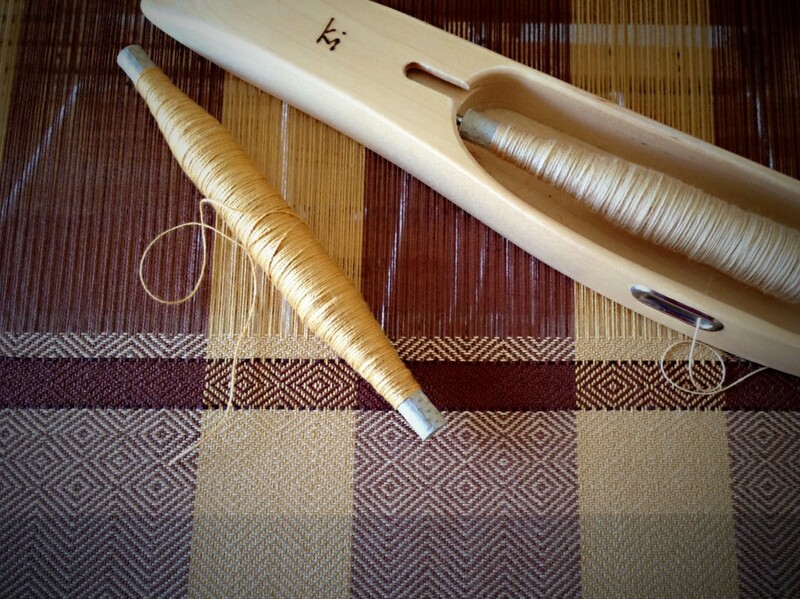 I love it when He sends a word at the moment we need it–even through a blog post about weaving. Thank you for giving such a sweet reply. It is surprising how much difference this cream color makes. If I use the same gold color for the weft that is in the warp, as I had planned, the gold weft looks harsh across the gold warp. 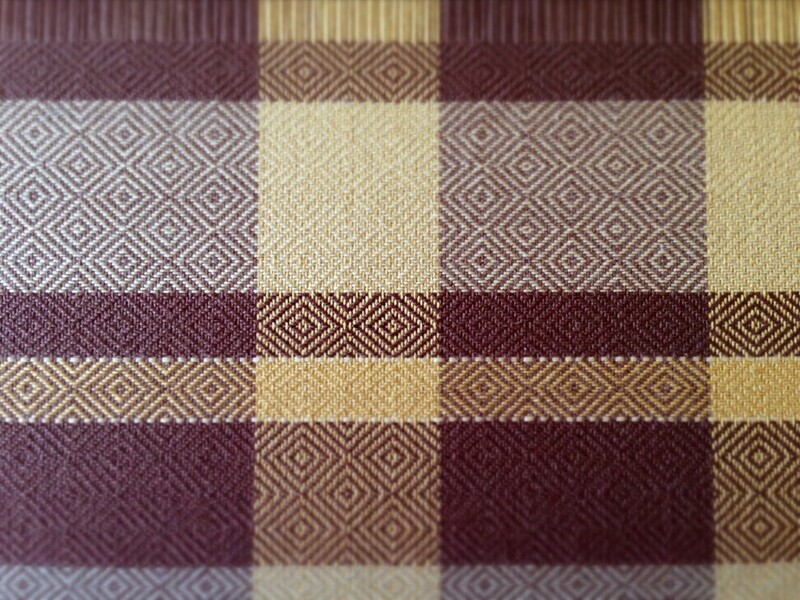 Switching to a weft in a lighter shade tones down the gold in the warp and gives the cloth a softer appearance. It makes sense to use weft colors that enhance the warp, even when it means changing my plans. Goose-eye handtowels. This is the beginning of a 10-meter / 11-yard warp. You have the opportunity to create the best outcome for others by adjusting to meet their needs. We get to serve others through the gifts God gives us. You are gifted. Maybe in speaking encouraging words, or in hands-on helping. Whatever your gifts, when you use them to serve others, you are the hands of God’s grace. And that grace may be the color someone else needs to soften their circumstances. Loving one another means serving, giving God’s grace to each other. That is when relationships flourish, when we adjust our plans to the other person’s advantage. In other words, I choose the weft that makes you look good. May your gifts bring the best color to your relationships.